A great new relationship with New England Home Magazine! I’ve been dying to share this news for some while and the time is now! I have forged a new relationship with the fabulous New England shelter magazine New England Home. NEH was founded only a few short years ago by Dan Kaplan, who has since moved on. But his indelible stamp of quality, elegance and sophistication lives on! As a matter of fact, Dan was introduced to my blog 2-1/2 years ago in that quirky bloggie nature of twisted corridors and strange associations because a post I wrote here about an event that New England Home sponsored was bundled in a Google search with my post on my interview in the Washington Post on the movie Something’s Gotta Give. Apparently, when folks Googled me because of the WaPo article, the results came up with both posts and many people clicked over to the New England Home site as well. I then received an email from Dan asking how that was happening – the referrals to their site. And a relationship was born! Shortly after that, I was introduced to their marketing director Katie Dammann and we’ve been chatting ever since about how we could work together. And, we finally are! When I first mentioned New England Home on my blog, they offered only a digital edition of the magazine (which they still do!) and it was apparent that additional content was needed in order to bring people to their site and keep them coming back. Over the last couple of years, they have done just that – even thought they have gone through a transition of owners. But, the new owners were smart to keep much of the staff in tact – from Kyle Hoepner who assumed the role of Editor in Chief, to homes editor Stacy Kunstel (whom you can follow on twitter), and Katie Dammann. Anyway, I was thrilled and honored to be asked if my ::Surroundings:: blog feed could become part of the New England Home online offerings. I take it as a huge compliment, given the quality of the magazine. Below is a screen shot of their web site and if you scroll down, you will see the link to my site and a link to Stacy’s Twitter feed. And so, as I blog here on ::Surroundings::, certain of my posts most relevant to the New England high end residential readers will be showcased on New England Home‘s website as well! And that’s not all! As a second part of this partnership, my kitchen makeover that I’ve begun to blog about is going to be a featured part of all of this. There are some details to iron out, but I will soon be able to announce the third partner in this project, who will play a large role in my kitchen makeover. While it is definitely still a DIY makeover (no, no hordes of contractors are going to come in and put in a $100K kitchen in my 10×4 space!) I am still very excited about what will be going on. So, (not to be coy), stay tuned! 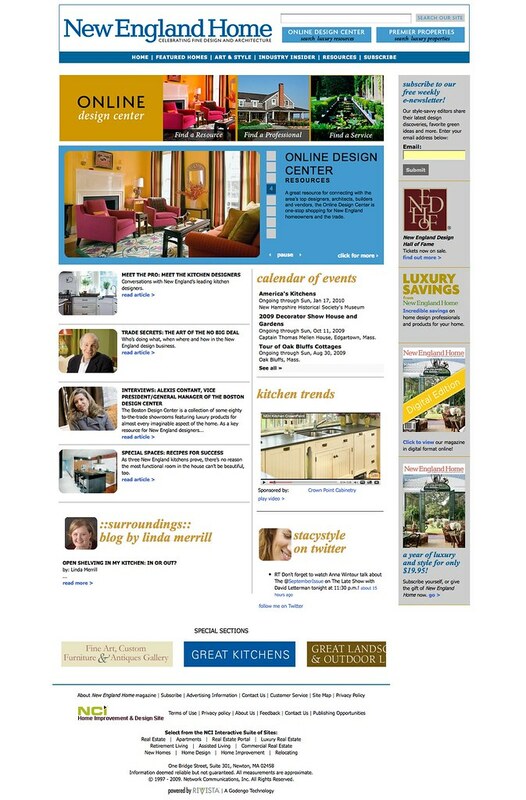 Meanwhile, please do click over to visit New England Homes’s website and take a browse of their digital edition. Purchase a subscription while you’re at it – you don’t even need to be in New England!! Wow. Congratulations–and well deserved. You really are a wonderful writer. Will stay posted and look forward to seeing more! Wow! Congrats!! I will def stay tuned! :0) I'm really looking forward to seeing your kitchen makeover. Congrats Linda! Living in RI I know the magazine…, and I'm also looking forward to your kitchen redo, especially since we're doing our kitchen over this fall. Linda this is SO, SO, SO, exciting. And I am SO happy for you. You work SO hard and deserve this SO much…(ok enough with the SO'S now). Anyway, this is great and I will enjoy following along. NEH made a great choice in YOU.